Whew! A whirlwind of a short story that took my breath away. Purpose: There is nothing more conducive to long-term happiness than knowing that your actions are making the world a better place. Wow! Yes, I see what you mean about writing about the same theme for the flash fiction challenge. This is powerful, held me from word one to word 296. I look forward to reading more! Sherri. Thank you, Sherri. Mothers are of one mind for the most part. I’ll be checking on more of your posts, too. My children made me paranoid. And depressed and impotent. The opposite true, too, but still. Love this, Mary. Which just gave me an idea… I’m going to borrow your picture. 😉 you’ll see why in a few. I adore Keillor’s take on Ferris wheels. The fact that I can see death up there is why I fear them. Every bit of what I wrote is true. Except for the hob nail boots. That was a metaphor! Serendipity at work again…I’ve been trying to take a picture for Garrison Keillor’s Ferris wheel piece ever since Christy sent it to me. That was an unforgettable ferris wheel ride. I was hooked till the 296th word! Reblogged this on Asya Derya Aygün. I enjoyed the ending and the build up. Skilful work. Mary, I read this when it was posted and told myself (rationally) I’d come back in the morning… well… it’s the small things that always trip you up. Honestly, it is. Love the photo, that character of yours seems very determined and she’s young, by the sound of it. We were all invincible once, now we know better. Nice piece. Wow! I admire your talent, both with camera and with word! Thank you! Now I have to go read (and look at) more of your work. I guess I’m happy I read this on Mother’s Day. Fine short! Thank you, Leigh. I’m glad you liked the photo, too. 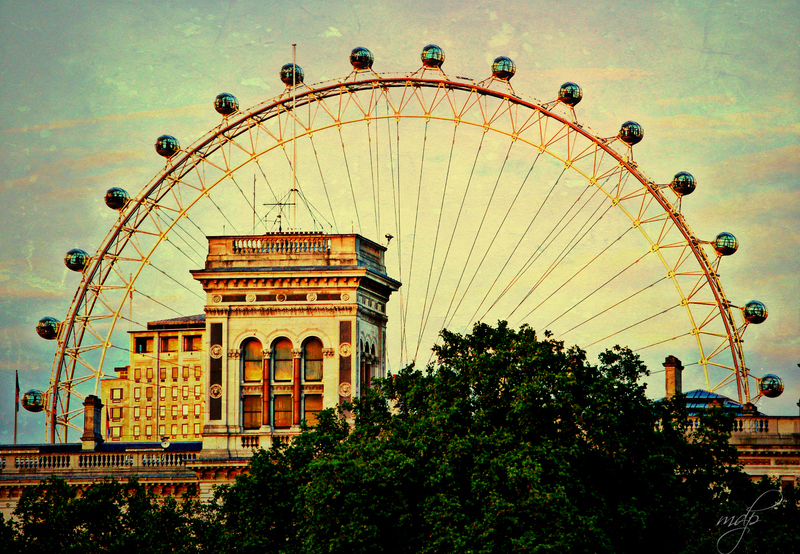 I love it, though I will probably never set foot on the London Eye! I can only admire its beauty from afar. Crafted piece of art like a pro. Good job. Wild words, this is art. From the photograph to the story you created out of it, simply brilliant. I think going short is the hardest thing in the world- you should see me trying to come up with something clever to say in a Hallmark card, I’m pathetic. Well, anyways, art is what I thought when I set to read this and art is what I thought when I was done reading it. I should get better at replying to comments. The truth is, you (and others) are so kind in your remarks I am usually too gobsmacked, and at a loss as how to reply. Thank you hardly seems like enough. Still. Thank you. Truly. Wow! Mary, this is a magnificent piece of writing! So vivid, so emotive. So beautifully descriptive. I loved it. Bravo. Aww, thanks Linda. That means a lot! So that I don’t feel like a stalker, I had to let you know that I’m back here to read this piece…again. It’ll be one of my favorites for a very long time. And, since I don’t have a crystal ball for my kiddos either, I’m borrowing your message in this story for my own mama brain. Oh my gosh, feel free to stalk me any time! (Well, my blog, anyway.) Seriously, you are too kind. Since you are stalking, though, I’ll tell you a secret about this piece — every single word is true (except for the hob nail boots — I just loved the sound of it).